Can Microsoft Surface RT play MKV videos? Discussion in 'Pavtube Software Studio' started by PavtubeVideo, Nov 12, 2012. Summary: This tutorial mainly explains you how to put and play all 1080p/720p MKV videos on Microsoft Surface RT tablet by converting MKV to Surface MP4 videos. The Microsoft Surface RT tablet has a 10.6-inch ClearType HD display with 1366×768 higher resolution. Its large screen is reall ideal for movie and TV shows watching on the go. However, due to the format limitation, sometimes you will find you cannot play MKV files on the RT based Microsoft Tablet proper or missing audio when playing MKV movies on Surface RT. So how if you want to get these 1080p/720p MKV videos playable on your Surface RT tablet? Get frustrated? Here you'll find the best solution. The reason you cannot get MKV videos working on Surface is simple: the default and downloaded player on the Microsoft Surface Tablet cannot find a suitable decoder for the codec in the MKV file. To solve these problems, a great method is to convert MKV to Surface RT compatible video formats along with some help from third-party tools. To achieve your goal smoothly, here i will take the all-in-one Pavtube Video Converter as an example to show you how to encode MKV to MP4 for viewing on Surface talbet. The equivalent Mac version is the Surface Video Converter Mac, which can convert MKV to Surface RT on Mac OS X (Include Lion and Mountain Lion). 1. Download, install and launch the Video Converter for Surface. And then click "Add Video" or "Add from folder" to import your source materials in .mkv format. Besides MKV, you can also load FLV, AVI, WMV, VOB, TiVo, MPG, MOV, etc. files to the program. Batch conversion is supported so that you can add multiple files. 2. Choose output format. Click "Format" bar to and select MP4 from the format list (MP4 is highly compatible with Surface tablet). You can easily get the optimized videos for Surface RT under Windows > Microsoft Surface Windows RT H.264 Video (*.mp4). The output videos could fit on Surface RT or Pro perfectly. If you like, you can click "Settings" to change the video encoder, resolution, frame rate, etc. as you wish. 4. Once the conversion complete, locate the files and transfer the converted MP4 videos to your Surface RT tablet. As you see, now you can effortlessly watch MKV videos on Suface RT Tablet. Enjoy! BTW, Pavtube's Thanksgiving Giveaway is coming soon (Nov. 14, 2012 - Dec. 10, 2012). Never miss the chance to join the promotion to buy one get another free!!! 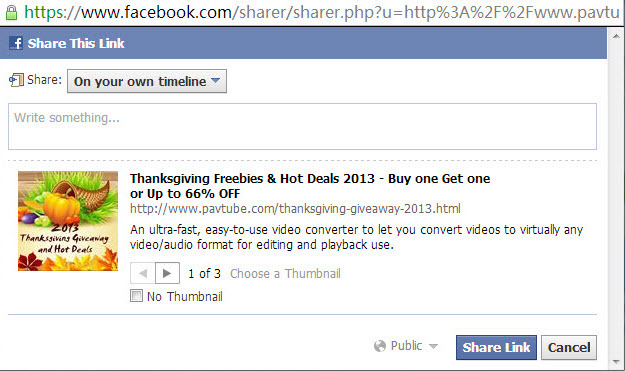 Click "Share on Facebook" button, insert "#PavtubeThanks2013", choose "Public", and click "Share Link". You will get another 20% coupon. The discounted link will be sent to your Facebook "Inbox" or "Other" within 24 hours on work days. Learn more: Pavtube Unveiled 2013 Thanksgiving Day Promotion with Giveaway and Huge Discounts!